If you’ve ever wondered how to make a dog drop something, try these training tips that will enable you and your dog to thoroughly enjoy a game of fetch. Say you’re trying to play fetch with your dog, or he decides to take an item of yours, and he runs. Either way, it’s incredibly frustrating to fail at retrieving an object from his mouth. Typically, if you decide to chase after your dog — all the while yelling — it will quickly become a game to him. The louder and angrier you get, the faster he runs. The best way to avoid this situation is to master the “drop it” command. The most common way to make your dog drop something is to set up a training situation where the dog has an approved item, like a toy, with which you will literally trade for another object. 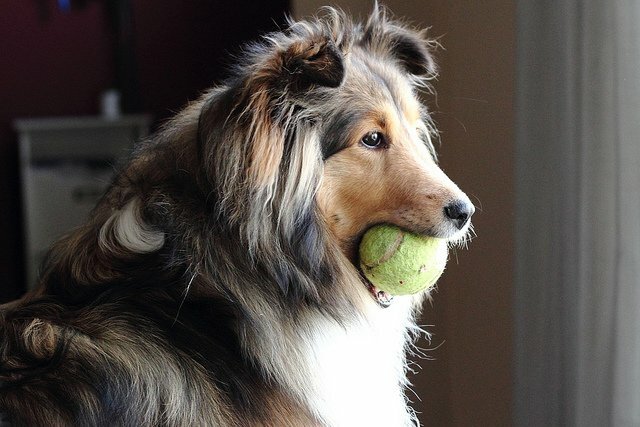 Offer your dog one of his favorite toys while saying “take it.” Teaching “take it” shows the dog your control over valuable household items; you can offer them or not at your discretion. Once the toy is in the dog’s mouth, hold up another toy or treat to the dog’s nose and say “drop it.” If you are offering something desirable, the dog will open his mouth and drop the object. If the dog doesn’t open his mouth, don’t pry his jaws open; this may create a dangerous situation for you and the dog. Try this exercise again with a more valuable food reward. Although many dogs learn “drop it” the easy way (mentioned above), some dogs need to learn the command before they are offered a valuable toy to drop. This will usually lead to a more reliable “drop it” command, but takes a little more time to train. To begin training, stock your pocket or treat bag with very high-value food treats; I suggest cooked chicken, cheese or hot dogs. You can either have your dog on or off the leash, depending on how interested he is in what you are doing. Walk around the room and say “drop it” just before you drop several treats on the ground. Help the dog find the treats by crouching down and pointing to the treats after they fall. Having your hand in the area where the dog is eating the rewards gets him used to the idea of your hand on the ground. This will help later in the training when you grab the toy he drops. Say “drop it” right before you drop treats while you are in various positions (sitting, standing and kneeling). 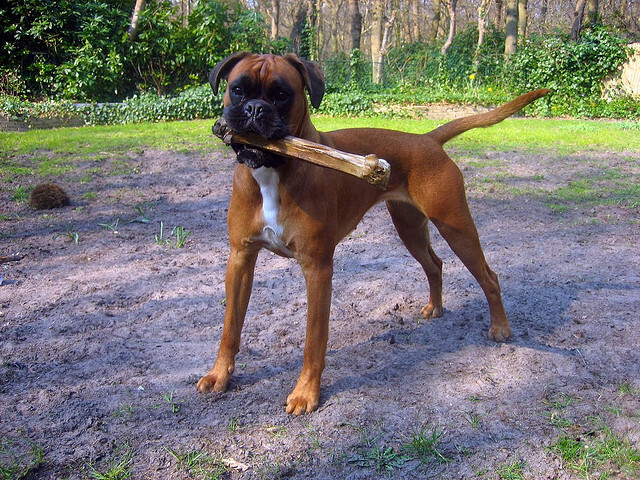 After several repetitions, your dog will begin to expect treats to drop on the ground. When you see this happen, you’re ready to move on to the next step. Begin practicing with an item that is not desirable to the dog, like a helmet or a purse. As soon as the dog looks at it, continue the exercise. Then work with another item in which your dog has a small amount of interest; gradually increase the value of the item. While your dog is mouthing this object, continue your “drop it” exercise. The dog should stop what he’s doing and go for the treats you’ve dropped. Your dog should start making an association between you saying “drop it” as he releases the toy in his mouth and looking for the treats on the ground. Pointing out where the treats have dropped is helpful. You can pick up the toy when he releases it without drawing too much attention to yourself because your dog will be used to having your hand near the ground. You can practice this exercise in many scenarios as your dog begins to understand that when you say “drop it,” something good will happen that requires him to release the item in his mouth. You can phase out the treats and try offering the dog another toy after he releases the first. Teaching your dog to “drop it” is very helpful when playing games like tug-o-war. It also allows you to protect your dog if he has something dangerous in his mouth. When training any command, remember to be patient and stay positive.